At ‘Google for India’ event in Delhi, Google CEO Sundar Pichai and a team of Google product leads speaks about the latest steps in the company’s strategy for bringing more Indians online and giving them a great experience when they get there. The announcements ranged from a January launch date for free WiFi in Railtel stations to new training programs for two million new Android developers over the next three years that make it easier for Indian developers to build solutions to local problems. 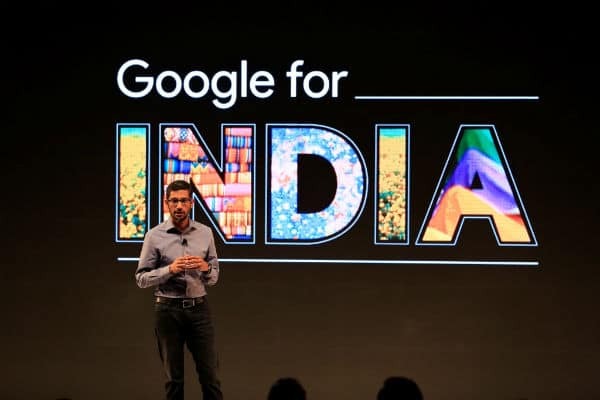 Pichai laid out Google’s three-step approach to promoting the Internet in India, and his team, many of them visiting from the U.S, talked to the concrete steps Google has taken to help solve the current challenges. First, Google aims to give people in India and other developing countries better access to the full Internet through better connectivity and high-quality software. Second, Google is making Google products work better for Indians. ● Google has created a new virtual keyboard that makes it easy to type in 11 Indian languages. ● Google also worked with the Ministry of Culture and the Archaeological Survey of India to add panoramic imagery of 250 Indian monuments, including Hampi and Mahabalipuram, to both the Google Cultural Institute and Google Maps. Third, Google wants to make it easier for Indians to build on top of Google’s global platforms like Android and Chrome to build solutions to local problems. ● The Chromebit, a small device that turns a monitor into a computer, will be available in India starting in January, meant to help boost computing in the education sector. ● Google pointed to one example of an Indian company, Flipkart, that is taking advantage of some of the latest technologies that are being built in to the Chrome platform for a better experience for Indian users. Flipkart’s new “progressive web app” built for mobile uses Chrome to create an experience that adapts to the user’s phone and the speeds of the mobile data network. To open the event, Rajan Anandan, Vice President of Google in India and Southeast Asia, helped explain both the promises and challenges of bringing the country online. “By 2018, more than 500M users will be online in India, from all 29 states, speaking over 23 languages. But in 2020, over 30% of mobile internet will still be from 2G connections. Google has been on a long journey in India to build products that connect more people, regardless of cost, connectivity, language, gender, or location,” Anandan said.